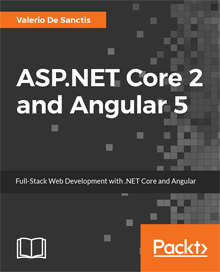 ASP.NET Core 2 and Angular 5 reached Top #1 Trending Book chart on Packt Publishing Web Site! I have just been informed that my ASP.NET Core 2 and Angular 5 book reached Top #1 Trending Book chart on Packt Publishing website! I would like to thank all those who purchased the book for this exceptional achievement, which makes an astonishing pair with the impressive ratings the book also got on the various Amazon platforms all over the world. During these weeks I’ll start to work on my next book, which will be mostly about cloud environments, microservices, IT security, privacy issues and… Well, I’ll definitely tell you more about all that soon enough! If you want to purchase the ASP.NET Core 2 and Angular 5 book in digital format, don’t forget to use the ASPCA50 promo code to get a 50% discount off the sale price!